boosted their current premium team of Springbok rugby ambassadors by bringing on board the young Jan Serfontein, the fast JJ Engelbrecht and the explosive Tendai 'Beast' Mtawarira. 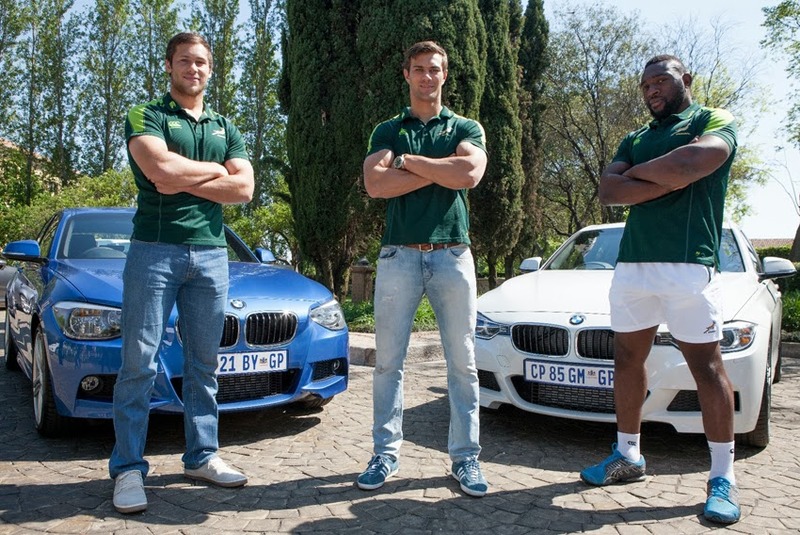 The dynamic trio joins Springbok captain Jean De Villiers, Springbok coach Heyneke Meyer, Schalk Burger, Pierre Spies, Francois Steyn, Jannie du Plessis and Springbok rugby legend Victor Matfield in representing BMW's interests in rugby. As part of the agreement, Beast and Engelbrecht will each receive the use of a brand new BMW 330d while Serfontein, upon his request, will be driving a new BMW 120d. "Our vehicles epitomise speed, power and dynamism in every respect and deliver ultimate performance in every field. This highlights all of the reasons we're involved in the dynamic, high-performance sport of Springbok rugby which has played such a huge role in showing the world just what South Africa is capable of," said Guy Kilfoil, General Manager, Communications and Public Affairs at BMW South Africa. "Furthermore, together with our ambassadors BMW South Africa is able to facilitate different experiences and provide added value to our loyal customers and South African rugby fans." As a BMW ambassador, Matfield for example, acts as host for BMW's VIP hospitality suites at local matches as well as provides expert opinion and analysis for BMW's rugby-specific micro-website. "As part of our commitment to our Springbok sponsorship, BMW South Africa also offers sporting entertainment to South African rugby fans through activations such as 'The BMW Challenge' - an interactive area where fans attending the Gauteng games during the Castle Lager Rugby Championship were able to test their performance against their favourite rugby players," said Kilfoil. "The BMW Challenge provided a unique opportunity for rugby fans to experience first hand just how much speed and dynamism is inherent in Springbok rugby, and of course in our vehicles."